Identifying heavy congestion traffic areas, the large number of mobile barricades will be supplied to Cyberabad Traffic Police to effectively channelize traffic. Hyderabad: People living around Cyberabad near the metro rail can now rejoice since traffic will be the least of their inconveniences. Following inspections at areas between Cyber Towers and Raheja Mindspace junction by DGP, Mahendar Reddy, MD, HMR NVS Reddy, Commissioner, GHMC Dana Kishore, and other senior officials, important decisions were taken in a review meeting to help smooth completion of Metro Rail without causing inconvenience to the people. Directed by Minister for Municipal Administration KT Rama Rao in a high-level meeting earlier, broad decisions were taken yesterday after a joint inspection and a review meeting. The outcome of the meeting was to help in immediate road improvement works and finding alternatives to execute Metro Rail works with least inconvenience to road users. Identifying heavy congestion traffic areas, the large number of mobile barricades will be supplied to Cyberabad Traffic Police to effectively channelize traffic. Road widening and improvement works will be carried out at all the identified junctions in the next few days. An additional 40 traffic marshals will be given by the L&T Metro to work under directions of Cyberabad Traffic Police while trail runs will be organized by Cyberabad Traffic Police with the help of HMR police and others to oversee traffic movement during peak traffic hours. Last year in November Prime Minister Narendra Modi had begun the opening of 30 km metro line of Nagole-Ameerpet-Miyapur. The ceremony was conducted in presence of Chief Minister K. Chandrasekhar Rao as well as others. It also enclosed parts of Corridor Three – Nagole to Ameerpet (17 km) as well as Corridor One of Miyapur to Ameerpet (13 km). 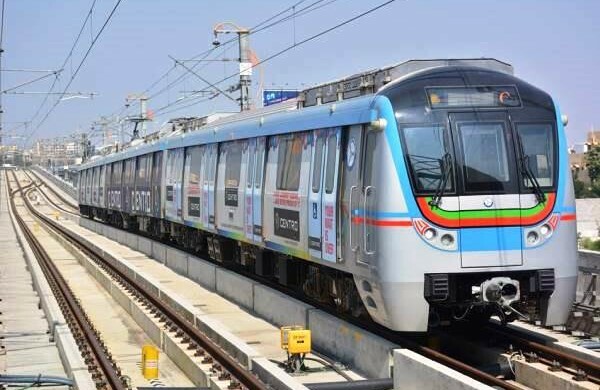 Till now around lakh passengers travel in Hyderabad Metro. With the new line becoming operational, the ridership is expected to double in the coming months. This project also is world’s largest public-private partnership. The government has given around ₹3,000 crore for land acquisition, shift utilities and widening of roads. L&T Metro Rail Hyderabad (L&TMRH) has invested over ₹12,000 crore. The Central Government too helped via Viability Gap Funding (VGF) to the tune of ₹1,458 crore. The entire work has been carried out approximately to ₹14,132 crore.